At the same time my son was looking for a new and improved holder for his CD's on his long drives to and from work. Having all your CD's fall out as you round a bend is not a great idea, it seems! 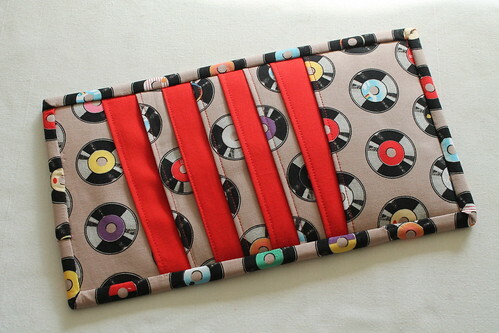 If you know a music-loving motorist that would appreciate a handmade gift this coming Father's Day, head on over to Plush Addict to find out how to make your own Visor CD wallet. Yes, that is a good idea - and we NEED one. And I'm proud to admit that I still use the round black objects featured in the fabric. Just bought a new turntable in fact! That's a great practical project Fiona, thank you. What a genius idea Fiona!! and the fabric is perfect! A fantastic job, I love the fabric and super neat topstitching. Always the best from you! That's a really nifty idea and you found the perfect fabric! Cute idea! I feel rather spoiled having a car I can just plug my iPod into mind you! Love, love that fabric! Going to check out the tutorial now. ooooooooooh! I do need one of these. whenever I open my glove box, CDs spill out all over the floor and i can't get the damn thing shut again!